The Ruelco RD-H is a 2-way normally open hydraulic controller that acts as a snap acting vent valve on loss of pilot pressure. This configuration of the Ruelco RD-H permits control of hydraulic pressure up to 10,000 PSI. A low pressure pilot supply is necessary to control 10,000 PSI of well pressure. A high ratio of hydraulic pressure to pilot control pressure ensures safe operation. A soft seal design ensures zero leakage in the hydraulic section. The internal spring and the hydraulic pressure act on the spool area act in tandem to open the valve, although each on its own provides sufficient force to open the valve. 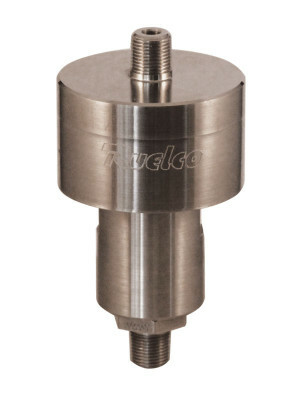 Can support pilot cap pressure of up to 5000 PSI.